"Nationalism and populism are the cancer of Europe"
"Nationalism and populism are the cancer of Europe." That is the firm belief of Felipe González, former prime minister of Spain. He has shared his hopes and fears with Euronews, touching on everything from the economic crisis and the future of the European project to the thorny question of Catalonia and its relations with Madrid. Ana Lazáro Bosch: Europe seems to have overcome the worst of the economic crisis, but the consequences are evident. Do you think Greece and the countries of southern Europe have paid a too high a price? Felipe González: Yes, yes, I think so, I am convinced. The austerity policy was suicidal. In monetary terms, no alternative policies were presented except one done by the ECB two years in. It has been badly thought out, the cost was too high, there has been unnecessary suffering and fracture. Ana Lazáro Bosch: In Spain, the crisis has left us with unstable contracts and low wages. Do you think the situation can be improved? Felipe González: It can be changed, absolutely, but it needs a plan and the political will. The truth is, the economic model of globalisation tends to redistribute income unevenly and create greater inequality. This is true even when the economy is picking up. Adjustments are much more dramatic and this is the effect we are experiencing in Spain. In Spain, the financial crisis has led to wage devaluation, precarity of employment and the growth of inequality. Ana Lazáro Bosch: Social democracy seems to be at a low ebb in Europe. The parties in the political family, to which you also belong, are being hit by defeat after defeat. Why? Felipe González: Like Billy Brant, I believe that social democracy has the potential to renew itself. I have just painted a picture of inequality for you. If that picture exists, and is accurate, then there is a clear function for social democracy. Things are different from 40 years ago, we have to take into account the new phenomena of globalisation, interdependence, competition and even an ageing population. In its essence, social democracy aims to fight inequality given the current conditions. So we need an accurate analysis followed up by appropriate responses. Ana Lazáro Bosch: Look at the UK, for example. Jeremy Corbyn has taken the reins of the Labour Party. Do you think he represents the path the Left must take, or is he an anachronistic character that harks back to the past? Felipe González: I don't like the word "anachronism". I think what he has done is bring back the old discourse of social democracy without considering the what is causing inequality in the current situation. Ana Lazáro Bosch: Do you think there is anyone who embodies this new drive for social democracy on the European political scene at the moment? Felipe González: Costa in Portugal is coping with the adjustment and the crisis and is responding. We pay little attention, but what he is doing is interesting. Tsipras in Greece suffers much more from a radical left position, as least in origin. Ana Lazáro Bosch: Populism is gaining ground in Europe, even in countries with solid democracies like France, Germany or the Netherlands. How do you explain this? Felipe González: Well, the first question for those who are not populist, the big parties, should be: where did we go wrong and allow populism to prosper? Discourse today is limited to denouncing the threat of populism and is fostering fears they are experts. The cancer in Europe today is a mixture of nationalism and populism. In the world, this is definitively embodied by Trump. 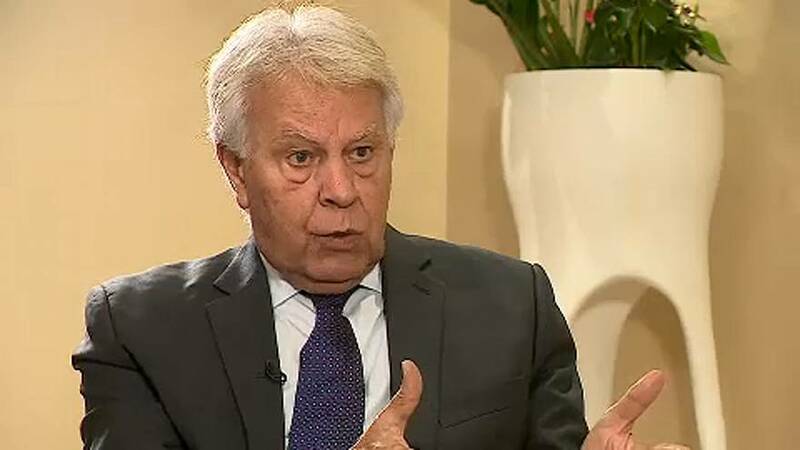 Felipe González: I would say there is nationalism. But this has an historical explanation with a social and psychological component. The countries you mention have only recently regained their national sovereignty from Soviet rule. The feeling is the Brussels will now take over that role. They are responding with nationalism because they do not understand how Europe is constructed, that shared space, the transfer of sovereignty to be shared, not lost. They have only recently got it back and are reluctant to give it away. Ana Lazáro Bosch: I have to ask you about Catalonia. How much responsibility do the governments of Madrid and Catalonia bear? Felipe González: They are not equal. The government in Madrid made operational failures. In policy terms, it did not react adequately enough, even with the late application of Article 155, a guarantee like that of the Fundamental Law of Bonn. But this does not put it on a par with the mistakes made by the separatists and nationalists. They have simply violated the Constitution, the Autonomous State and public interest. They have acted in full knowledge that is what we call an institutional coup d'etat that ended on September the 6th and 7th. On those days, Catalonia's institutions were liquidated. They were only restored through the intervention of the courts and the central government. Ana Lazáro Bosch: One last question. You witnessed the crucial intervention of the Spanish monarchy after the coup of 81. Felipe VI's intervention in the Catalan crisis has caused controversy. What role do you think the monarchy should play in the Spain of the future? Felipe González: Controversies and interventions like the one in October would be less necessary if the central government fulfilled its role. The situation was critical and it was absolutely necessary, essential, and it was done in accordance with the constitutional mandate. So his intervention as head of state was impeccable. Did everyone appreciate the intervention? No, not at all. But the truth is, the majority of Spanish citizens who are feeling a bit orphaned, were reassured, I can tell you. Ana Lazáro Bosch: Thank you very much, Felipe Gonzalez, for giving this interview to Euronews. Felipe González: I am delighted, very happy.